Science, technology, engineering, and math, widely known as STEM fields, have yet to reflect the rapid growth of the Hispanic population in the United States. José Castellón is working hard to buck this trend. Castellón has worked with global security company Northrop Grumman since 1982 and spent most of that time working in an engineering capacity. He interned as a lab technician performing tests on electronic units before joining the company’s electrical design integration department in 1985. He earned his master’s degree in electrical engineering from Stanford. He has worked on satellites that were designed and built for NASA and the Department of Defense. Lately, though, Castellón has taken on a different side of the company. In 2009, he was approached by Northrop Grumman’s corporate office to gauge interest in creating an enterprise-wide Hispanic employee resource group (ERG). A summit was formed with other Hispanic employees, and One Adelante was created a year later. This group gave Hispanic employees an opportunity to come together across organizational and geographical lines. Castellón served as the group’s chair for three years. “This is where I became a born-again Hispanic,” says Castellón, who had spent the first 20 years of his career with Northrop Grumman trying to fit into the company’s culture rather than distinguishing himself as a member of the Hispanic community. After joining Northrop’s ERG, though, he established himself in both realms and ignited in himself a new passion for the importance of diversity within his company. “After 31 years in engineering, I felt the timing was right to see if I could pursue my passion in diversity and inclusion,” he says. 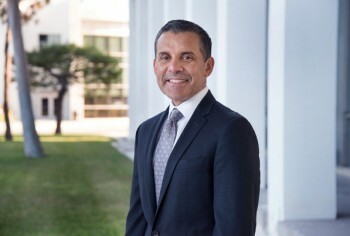 In 2013 Castellón took his current position as global diversity and inclusion director within the Northrop Grumman Aerospace Systems sector. Despite the challenges, Castellón is confident there are ways to raise the number of Hispanics in STEM fields. For him, it begins and ends with education. He wants to see a nationwide program that gets Hispanic students interested in STEM careers at an early age. By early, he means elementary and middle school. “Otherwise, it’s too late to get their attention,” he says. It will take a team effort between schools, parents, the private sector, and universities to make a program like this happen and work. Northrop Grumman supports a variety of efforts to get more minority students interested in STEM. The company invests in STEM outreach programs at local schools in underserved communities, including areas with significant Hispanic populations. The company also sponsors and recruits Hispanic candidates at conferences, such as the annual conference held by Great Minds In STEM at Northrop’s Hispanic Engineers National Achievement Awards Conference. Within its own walls, Northrop Grumman encourages participation in employee resource groups like One Adelante, where employees can develop their leadership skills and get exposure to senior management. The Hispanic population is currently underrepresented in STEM fields but it doesn’t have to stay that way. According to Castellón, it’s a matter of getting the word out and letting students know that careers in these areas of expertise are attainable.